Audi S3 and S3 Sportback with S tronic * Efficient and fast dual-clutch transmission for the S3 * Quicker acceleration paired with even higher fuel efficiency * Particularly sporty combination in the compact class * Available now A milestone in transmission technology is now available in the Audi S3 and S3 Sportback sporty compact models. The S tronic dual-clutch transmission unites the powerful two-liter TFSI engine with the road in a manner that is both sporty and efficient. This ensures quicker acceleration, high agility and ride comfort along with improved fuel efficiency. A genuine marvel of engineering, the revolutionary S tronic dual-clutch transmission has been a sensation ever since it debuted in the Audi TT 3.2 quattro in spring 2003. It combines the advantages of a compact six-speed manual transmission with the qualities of a modern automatic. The driver thus benefits from enormous agility and driving pleasure with acceleration that is both harmonious and dynamic, without any perceptible interruption in the power flow. This is coupled with good economy thanks to low fuel consumption, and convenient operation. The ultracompact S tronic with twin multi-plate clutch can simultaneously preselect two gears. With its ingenious electrohydraulic operation, it shifts from one gear to the next in a split second. It can thus enable engine torque as high as 350 Nm (258.15 lb-ft). The powerhouse engine in the S3 is an ideal partner: the 2.0 TFSI has already won the “Engine of the Year Award” four times. It supplies 195 kW (265 hp) and maximum torque of 350 Nm (258.15 lb-ft), which remains constant from 2,500 to 5,000 rpm. At a weight of just 152 kilograms (335.10 pounds), this turbocharged direct-fuel-injection engine propels the Audi S3 and the S3 Sportback into the exclusive class of compact sports cars. The S tronic makes the dynamic spearhead of the A3 family even speedier. It further reduces, by two-tenths of a second, the time required to accelerate from zero to 100 km/h (0 to 62.14 mph). More specifically, in just 5.5 seconds for the S3 and 5.6 seconds for the Sportback. At the same time, fuel consumption has improved to 8.3 liters/100km (28.34 mpg) with CO2 emissions of just 193 g/km (310.60 g/mile) (A3 Sportback: 8.4 liters/100km (28.00 mpg) and 195 g/km (313.82 g/mile). Both of these sporty models are now available at dealerships: the S3 for €38,900 and the S3 Sportback for €39,800. 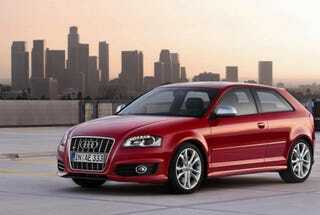 AUDI AG sold a total of 964,151 cars in 2007 and thus achieved its twelfth consecutive record year. With revenue of €33,617 million and profit before tax of €2,915 million, the company attained its best figures ever. Audi produces vehicles in Ingolstadt and Neckarsulm (Germany), Györ (Hungary), Changchun (China) and Brussels (Belgium). At the end of 2007, production of the Audi A6 started in Aurangabad, India. The company is active in more than 100 markets worldwide. AUDI AG’s wholly owned subsidiaries include Automobili Lamborghini Holding S.p.A. in Sant’Agata Bolognese (Italy) and quattro GmbH in Neckarsulm. Audi currently employs around 57,000 people worldwide, including 45,000 in Germany. The brand with the four rings invests more than €2 billion each year in order to sustain the company’s technological lead embodied in its “Vorsprung durch Technik” slogan. Audi plans to significantly increase the number of models in its portfolio by 2015 to 40.